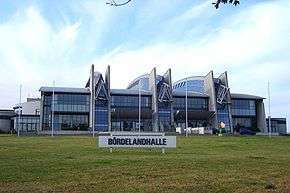 The GETEC Arena (until 2011: "Bördelandhalle") is an indoor sporting arena located in Magdeburg, Germany. The maximum capacity of the arena is 7,071 people for handball games and 6,820 for boxing matches. It is the current home to SC Magdeburg's Handball-Bundesliga team. This article is issued from Wikipedia - version of the 2/27/2014. The text is available under the Creative Commons Attribution/Share Alike but additional terms may apply for the media files.